Imagine the largest structure in the world—a residential tower stretching two and a half miles into the sky, a high-tech luxurious tower that straddles more than one hundred square blocks of New York City. A tower one thousand floors high, with its own climate, shopping malls, parks, schools, and entertainment. A tower where society is stratified according to how high in the tower people live. This is Manhattan, 2118. Robots and comps handle the day-to-day work, leaving young people free to party as much as they want. Communication is instantaneous with texts, vids, email, and audio feeds projected onto the contact lenses that everyone wears. One summons a hovercraft with a whisper to move on to the next party or shopping trip or hookup. People enter their friends’ apartments by retinal scan; after all, no one should have to actually knock to gain entry. Avery lives on the thousandth floor. Perfect Avery. Her rather average looking parents paid a fortune to have a genetic expert comb through their genes and pull out the ones guaranteed to produce perhaps the most beautiful, the most perfect girl anyone has ever seen. Avery lives a perfect life, of course, surrounded by lovely girlfriends and handsome young men who can only dream of dating her. For Avery shares a secret with her adopted brother Atlas, a secret that must never be revealed. Katharine McGee populates her first novel with clearly defined personalities guaranteed to captivate the teen reader. Even though most enjoy the privileges of beauty and extreme wealth, each character has secrets to hide. Lovely Leda, Avery’s best friend, just returned from a summer in rehab and fights her addictions every day. Eris learns that she is not who she believed she is; required genetic testing shows she is not her father’s daughter. Instead, she is the result of her mother’s brief affair with another man. Eris’s “father” turns them out, and Eris and her mother must move hundreds of stories lower where rent is cheap and life is squalid. One of the most interesting characters is tech genius Watt. Quantum computers are illegal; those possessing them go to prison for life. As a 13-year-old student at MIT, Watt built a quantum computer that a professor made him destroy, but not before he transferred its programs into a cubic core. Fearful of being discovered, Watt pays a shady surgeon to install a super powerful, but tiny Nadia—as he calls his quantum—directly into his brain. Now Nadia is with him constantly, able to hack anything, anywhere, at any time. In fact, he makes his living hacking private information and selling it to those who are willing to pay big. Leda, for example, wants to know why Atlas won’t hook up with her again. The juxtaposition of unimaginable luxury and glamour, advanced technology, distinctive personalities, and teen emotions makes for a quick and entertaining read. The narratives, told in multiple points of view, mingle and merge, twining together, then unraveling, enthralling the reader in the continuous action that culminates in a glamourous party that Avery and Atlas throw for a hundred of their closest friends. And as the party breaks up, as people stumble into the elevators and make their way to their homes on the 950th or the 850th level, a handful of Avery’s friends climb through a hidden entrance to the roof where no one is ever supposed to go. Then a girl falls from the roof, falls one thousand floors. Will anyone pay for this senseless tragedy? While the book works well as a standalone, it’s billed as the first of a trilogy. 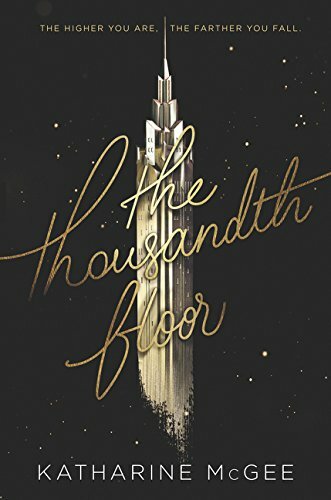 Readers are sure to eagerly await the next book to follow the drama of those who live in the thousand-floor tower, where even the beautiful and wealthy have their own dirty secrets!